Bringing the Makita SH01ZW Circular saw to the top selling Makita Cordless LCT209W Combo kit , which we Reviewed Here can only prove to be a winner. Saving over $300 against list price of the individual packages, the SH01ZW circular saw is a natural next addition to the toolbox. The SH01ZW is powered by Makita's 12V max Lithium-Ion battery delivering plenty of power for the normal tasks. The SH01ZW 12V max Lithium-Ion Cordless 3-3/8" Circular Saw runs at a no-load speed of 1,400 RPM. The bevel capacity is 0-45 degrees working at a maximum cutting depth of 1-inch (90 degrees) and 5/8-inch (45 degrees). The handy blower function keeps the line-of-cut clear removing dust and the ergonomic soft grip handle along with its compact design provides good comfort when working for extended periods. Coming from one of the best tool manufacturers Makita means that you are supported by a great warranty. The SH01ZW is another 12V max Lithium-Ion cordless solution that delivers pro power and pro speed in an ultra-compact size. 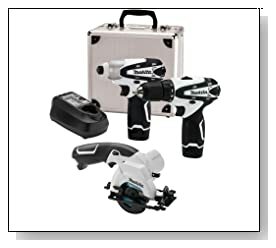 The addition of a very good little saw to the best selling Makita LCT209W Combo kit, ideal for handymen makes this now worthy of further investigation for anybody looking for a great combo kit. Hardware Home Store is a participant in the Amazon Services LLC Associates Program, an affiliate advertising program designed to provide a means for sites to earn advertising fees by advertising and linking to amazon.com.